A unique identifier for the service. Useful if installing multiple instances on the same machine. 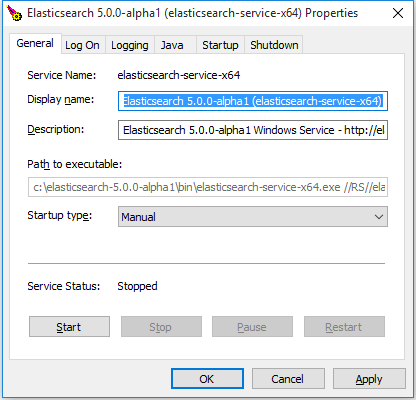 Defaults to elasticsearch-service-x86 (on 32-bit Windows) or elasticsearch-service-x64 (on 64-bit Windows). Log directory, defaults to %ES_HOME%\logs. Data directory, defaults to %ES_HOME%\data. Configuration file directory (which needs to include elasticsearch.yml and log4j2.properties files), defaults to %ES_HOME%\conf.